You are here: Home / Great Deals / Christmas Deals / FREE Letters From Santa! I have another fun Santa-themed FREEbie for you today! 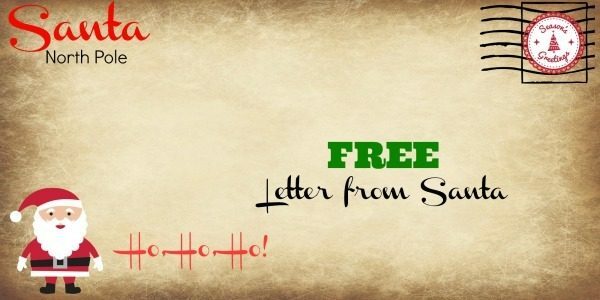 Your kids can get FREE letters from Santa with a North Pole postmark when they send him one! This is such a fun idea! I’m totally doing this with my daughter. She will get such a kick out of getting a letter back from Santa! Have your child write a letter to Santa and have them seal it in an envelope they address to: Santa Claus, North Pole. Tell the child that you’ll place a stamp on it and mail it to St. Nick for them. Later, when alone, open the envelope, read the letter and write Santa’s response on the back of the child’s letter. Have Santa mention it’s important to be green and that’s why he is writing on the back. When responding, be sure to reference your child’s notable accomplishments not included in their letter, i.e., Santa is so proud that you volunteered to help ____, or Santa is really impressed with the great job you’re doing in school — especially with math, etc. Sign it Santa Claus with a P.S. to get to bed early Christmas Eve. Place the letter into a new envelope addressed to the child at his or her home address. Be sure to include: Santa Claus, North Pole, as the return address on the envelope. And don’t forget to apply a First-Class Mail® stamp. When Santa’s letter arrives, have your camera ready when you ask your child to open the letter and read it out loud. Tweet the photos using the #SantaLetters and post them on Facebook. Keep the letters in a scrapbook as a great family keepsake along with the photos.